The Admiral Gorshkov frigate during the final rehearsal of the naval parade to celebrate Russian Navy Day in Kronstadt. Originally designed to test Moscow’s scientific inventions and explore the oceans, the first ship of the Admiral Gorshkov series is now a true force to be reckoned with. In 2006 Russia planned to incorporate all its latest technologies into its 22350 ship project. The vessel was initially designed to be a scientific ship for studying the world’s oceans but it’s also been used for testing the country’s newest military naval systems. However, when the economic crisis hit Russia in 2008, the government decided to write off the project’s scientific duties and reclassify 22350 to a military function. 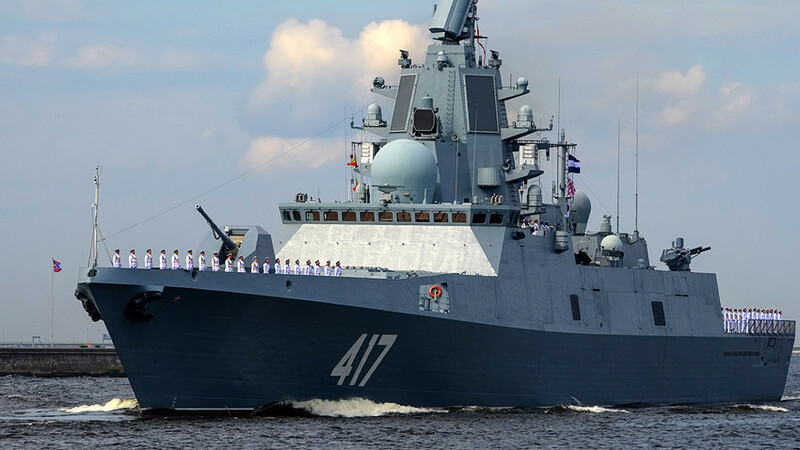 So the first ship of the Admiral Gorshkov series is now effective against targets both above and under the water, can take out enemy forces with precise missiles, and do reconnaissance missions. “Since the very beginning the ship became somewhat of a testing range for an entire spectrum of modern Russian scientific and reconnaissance equipment, as well as for new weapons that have already been adopted to the military. The latter of those were Kalibr cruise missiles shown to the world during the Syrian operation,” Viktor Murahovsky, editor-in-chief of Homeland Arsenal magazine, told Russia Beyond. But as he noted, in the end it was decided to completely reclassify the ship into a military vessel, and all scientific devices were taken away from it. It will join Russia’s fleet this August. According to Murahovsky, it’s got a displacement of 5,400 tons and is charged with 16 Kalibr class cruise missiles. These rockets can hit targets at distances of up to 2,500 km and travel 20 meters above ground, skirting across the terrain loaded with 450 kg warheads. Experts say these types of missiles are a new type of deterrence weapon which can be used as an alternative to nuclear missiles. At the moment the Russian military is battle testing the naval version of the notorious Pantsir-S1 air-defence system that will be added to the Admiral Gorshkov frigate. But for now the previous era Redut defence system is in operation. The ship is also armoured with a 130 mm artillery gun that can eliminate targets at distances of up to 23 km. “This frigate has numerous computer systems that can do most of the work previously done by humans. They include navigation and operating the ship’s weapon and intelligence systems,” mentioned the expert. The vessel can reach 30 knots (around 30 mph) and cover up to 4,000 sea miles on a single tank. It requires a crew of about 200 to run all systems. On Feb.26 the Defense Ministry ordered four ships for the 22350 project. They are expected to be part of the fleet by the end of 2022.The MoD has also pumped more money into the further development and modernization of the project. As Murakhovsky noted, the country needs at least 12 more ships of this type to defend the country’s sea routes and borders.